Pre-mRNA splicing is an essential post-transcriptional process in all eukaryotes. In vitro splicing systems using nuclear or cytoplasmic extracts from mammalian cells, yeast, and Drosophila have provided a wealth of mechanistic insights into assembly and composition of the spliceosome, splicing regulatory proteins and mechanisms of pre-mRNA splicing in non-plant systems. The lack of an in vitro splicing system prepared from plant cells has been a major limitation in splicing research in plants. Here we report an in vitro splicing assay system using plant nuclear extract. Several lines of evidence indicate that nuclear extract derived from Arabidopsis seedlings can convert pre-mRNA substrate (LHCB3) into a spliced product. These include: (1) generation of an RNA product that corresponds to the size of expected mRNA, (2) a junction-mapping assay using S1 nuclease revealed that the two exons are spliced together, (3) the reaction conditions are similar to those found with non-plant extracts and (4) finally mutations in conserved donor and acceptor sites abolished the production of the spliced product. This first report on the plant in vitro splicing assay opens new avenues to investigate plant spliceosome assembly and composition, and splicing regulatory mechanisms specific to plants. Shortly after the discovery of introns in 1977, different groups developed the mammalian cell-free system (in vitro), using nuclear or cytoplasmic extracts, which were competent for pre-mRNA splicing [1–3]. Subsequently, the preparation of efficient splicing extracts and the in vitro splicing assay have been adapted to other organisms such as budding yeast (Saccharomyces cerevisiae) and fruit flies (Drosophila melanogaster) [4, 5]. The development of mammalian, yeast, and Drosophila in vitro systems to study pre-mRNA splicing has provided essential insights into spliceosome assembly, its composition and splicing mechanisms in non-plant systems. The characterization of the splicing two-step trans-esterification reaction, pre-mRNA splicing intermediates, and the formation of final mature mRNA and lariat structure of intron have all been revealed by in vitro splicing studies [3, 6]. Furthermore, in vitro splicing combined with immunodepletion has long been used to determine the roles of spliceosomal components, such as small nuclear ribonucleic proteins (snRNP) [7, 8]. Several other splicing regulators were characterized by their ability to promote the in vitro splicing assay [9, 10]. Furthermore, the formation of spliceosomal complexes and their stepwise assembly pathway have been deduced in vitro by native (nondenaturing) agarose/polyacrylamide gel electrophoresis [11–13]. Additionally, many in vitro biochemical splicing studies have allowed purification of spliceosomes and provided a wealth of information on the spliceosome’s composition, its structures, and the structure conformational dynamics of spliceosomal complexes [13–21]. The identification of additional splicing regulatory cis-elements, such as splicing enhancers or silencers and their cognate factors, has also been expedited by studies using in vitro biochemical assays [22–27]. The in vitro splicing assay has also been a valuable technique for dissecting abnormal splicing events, which cause human genetic disease, and in developing new therapeutic approaches for human disease [2, 28]. Finally, the in vitro splicing assay has been used to evaluate molecules with splicing inhibitory functions, such as spliceostatin A . These are some examples to illustrate how in vitro splicing assays have contributed to important information on regulatory mechanisms of gene expression. The in vitro splicing systems have been, and will continue to be, indispensable tools for studying the mechanism of splicing. As in animals, pre-mRNAs from a majority (over 80%) of plant genes contain non-coding sequences and are processed to generate mature mRNAs [30, 31]. Recent studies indicate that the developmental and environmental cues can reprogram gene expression in plants by regulating post-transcriptional processes, especially pre-mRNA splicing [31–38]. However, many aspects of pre-mRNA splicing in plants are yet to be elucidated. Furthermore, the composition of the plant spliceosome and its assembly intermediates are currently undefined [39, 40]. Thus, the study of pre-mRNA splicing in plants requires innovative approaches, which will greatly empower this field of research. In spite of the absence of an in vitro plant-splicing system, efforts have been made to identify plant spliceosomal components. Bioinformatics analyses using sequence similarity have identified the core components of the plant spliceosome, including five snRNAs and several orthologs of known spliceosomal proteins [40–44]. Likewise, the highly conserved sequences at the 5′ splice site (5′ss), 3′ splice site (3′ss), polypyrimidine tract and branch point sequence (BPS) are similar between plants and animals . These similarities and some reports on splicing of plant introns in mammalian splicing extracts [45, 46] suggest similar basic mechanisms of intron processing across eukaryotic systems, but there are also numerous indications of plant-specific splicing regulatory mechanisms. For example, animal introns cannot be processed or animal transcripts are aberrantly spliced in plant systems [47, 48], the average sizes of plant introns are shorter than their mammalian counterparts , and analysis of proteins similar to mammalian spliceosomal proteins indicates that there is almost twice the number of plant splicing factors compared to human splicing factors [40, 44]. Other studies have also shown that plants and animals use different mechanisms to recognize splice sites, especially 3′ splice sites [49–52]. Furthermore, comparative analysis of alternative splicing (AS) events between plants and animals has revealed that intron retention is the predominant mode of AS in plants [53, 54], whereas exon skipping is the predominant mode in animals . Although the pre-mRNA splicing mechanisms in plants are poorly understood, based on the reasons cited above it is likely that the mechanisms of recognition of introns and exons involve both similar and plant-specific mechanisms. The development of in vitro systems to study RNA-related mechanisms in plants is limited and challenging [40, 56, 57]. An in vitro pre-mRNA splicing system to uncover plant splicing regulatory mechanisms has long been awaited [39, 40]. Therefore, despite difficulties inherent to plant cells, here we describe our efforts to develop an in vitro system for plant pre-mRNA splicing using nuclear extract (NE) prepared from Arabidopsis seedlings. We present a detailed procedure for the preparation of the NE and a subsequent in vitro splicing reaction using a plant pre-mRNA substrate containing a single intron from light-harvesting chlorophyll B-binding protein 3 (LHCB3). We show that plant NE is capable of converting LHCB3 pre-mRNA substrate to the size of expected mRNA. This is the first step toward establishing a plant-derived in vitro pre-mRNA splicing assay. This study opens new avenues to investigate spliceosome assembly and composition, splicing regulatory mechanisms specific to plants, and thereby enhances the overall understanding of post-transcriptional gene regulatory mechanisms in eukaryotes. The nuclear extract preparation method presented here is a modification of protocols described previously [58–60]. For plant material preparation, seeds (50 mg) of Arabidopsis thaliana ecotype Columbia-0 (Col-0) were surface-sterilized with 70% ethanol followed by 15% bleach and stratified for 3 days at 4 °C. Then, seeds were placed into 100 ml of Murashige and Skoog (MS) medium (1× MS basal salts, 1 ml/l MS vitamin solution, and 1% sucrose, pH 5.7) in a 250 ml flask and moved to a growth chamber. Seedlings were grown in a flask on a shaker at 150 rpm in dark at 24 °C for 4 days. Four-day-old seedlings were harvested, rinsed three times with Nanopure water, and excessive water was removed using a few layers of Kimwipes. Afterwards, the seedlings were weighed, directly frozen in liquid N2, and stored at − 80 °C. For nuclear protein preparation, 5 g of etiolated seedlings were ground into a fine powder in liquid nitrogen. Subsequently, the sample was homogenized in 25 ml of Honda buffer (1.25% Ficoll 400, 2.5% Dextran T40, 0.44 M sucrose, 10 mM MgCl2, 0.5% Triton X-100, 20 mM HEPES KOH, pH 7.4, 5 mM DTT, 1 mM PMSF, and 1% protease inhibitor cocktail [Sigma-Aldrich, St. Louis, MO, USA; catalog number: P9599]) for 15 min on ice, with gentle mixing every minute. The homogenate was filtered through two layers of Miracloth into a 50 ml Corex tube. Then the residue left behind on the Miracloth was washed with 25 ml ice-cold Honda buffer, and then the filtration step was repeated and collected into the same Corex tube. The filtrate (total 50 ml) was centrifuged at 2000g for 15 min at 4 °C. 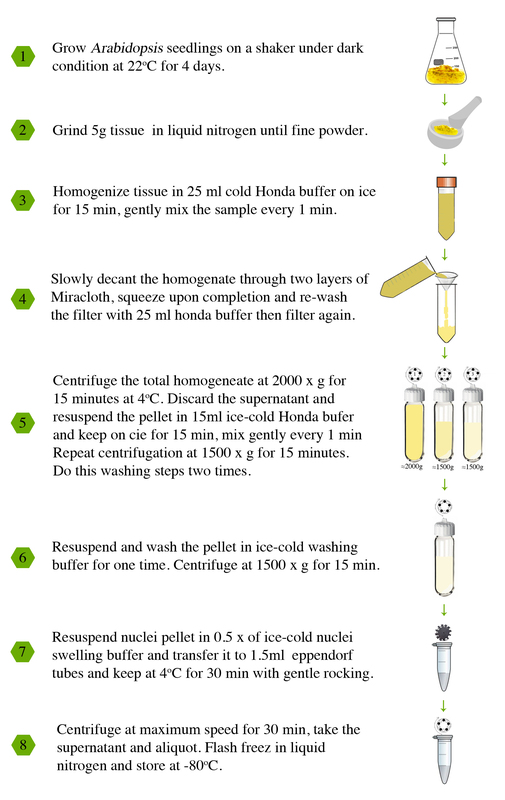 The supernatant was discarded and the pellet resuspended in 15 ml ice-cold Honda buffer, then incubated on ice for 15 min with gentle mixing every minute. It is not recommended to pipet up and down when mixing, as this can disrupt the nuclei; instead, a camel-hair brush should be used to resuspend the nuclei pellet. After complete resuspension, the sample was centrifuged at 1500g for 15 min at 4 °C. This washing step was repeated two times. The pellet was then resuspended in 15 ml ice-cold washing buffer (20 mM HEPES KOH, pH 7.9, 100 mM KCl, 0.2 mM EDTA, 10% (v/v) glycerol, 1 mM DTT, 1 mM PMSF, and 1% protease inhibitor cocktail [Sigma-Aldrich, St. Louis, MO; catalog number: P9599]) for 15 min on ice, mixed gently every minute. It is also not recommended to mix by pipetting here. After complete resuspension, the sample was centrifuged at 1500g for 15 min at 4 °C. The nuclei pellet was then resuspended in 0.5× (150 μl) ice-cold nuclei swelling buffer (50 mM Tris–HCl (pH 7.9), 10 mM 2-mercaptoethanol, 20% glycerol, 5 mM MgCl2, 0.44 M sucrose, 1 mM PMSF, and 1% protease inhibitor cocktail [Sigma-Aldrich, St. Louis, MO, USA; catalog number: P9599]) and transferred to a 1.5 ml microcentrifuge tube, then incubated at 4 °C for 30 min with gentle rocking. The extract was then centrifuged for 30 min at maximum speed (16,000g) at 4 °C and the supernatant removed to a new 1.5 ml microcentrifuge tube. Then, the NE was distributed into 50 μl aliquots, flash-frozen in liquid nitrogen and stored at − 80 °C for in vitro splicing assay. For in vitro pre-mRNA synthesis, DNA templates were amplified by PCR from Arabidopsis genomic DNA, using a gene-specific forward primer plus SP6 promoter sequence and reverse primer plus an adaptor sequence, which could be used for specific amplification of the spliced product. PCR products of the correct size were then gel-purified using the Thermo Scientific GeneJET Gel Extraction Kit (Thermo Fisher Scientific, Waltham, MA, USA; catalog number: K0691). Purified DNA templates were quantified using a NanoDrop 1000, and approximately 0.250 μg of amplified DNA template was used for in vitro transcription. 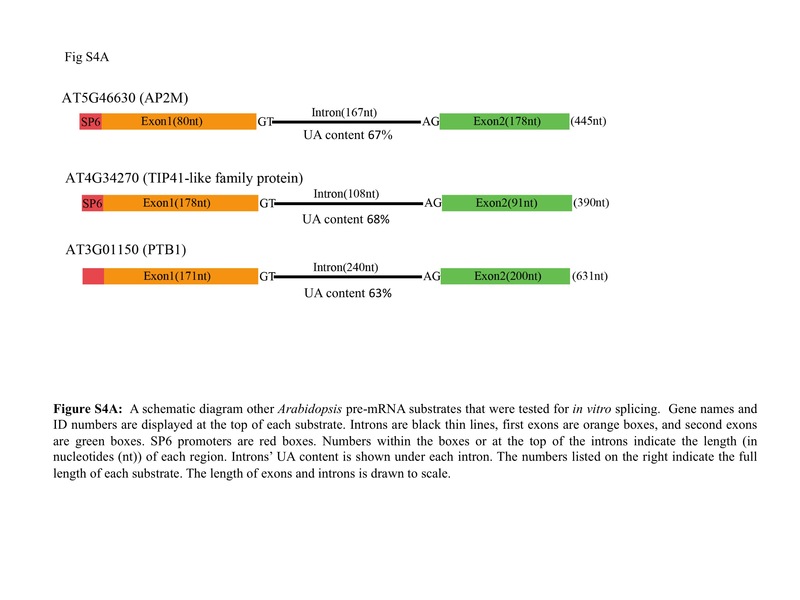 To generate mutations at conserved splicing sites, DNA template sequences with desired sequences were synthesized at Integrated DNA Technologies, Inc. (Coralville, IA, USA; https://www.idtdna.com). [32P]-labelled pre-mRNA substrates were prepared using an in vitro transcription system as described previously in . 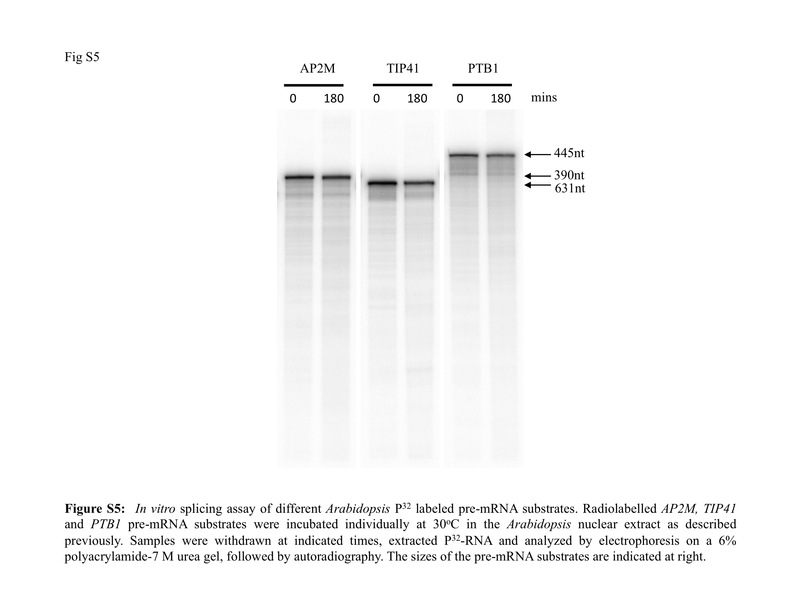 The pre-mRNA substrates were internally labeled with 45 μCi of [α-32P] UTP (800 Ci mmol−1, PerkinElmer, Waltham, MA, USA) using SP6 RNA polymerase (Fermentas, Thermo Fisher Scientific, Waltham, MA, USA; www.fermentas.com) in the presence of 500 μM ATP and CTP, 50 μM GTP and UTP, 50 μM cap analog (7mGpppG), and 20 U RNase inhibitor. In vitro synthesized [32P]-labelled pre-mRNAs with the correct size were gel-purified using TNS solution (25 mM Tris–HCl (pH 7.5), 400 mM NaCl, 0.1% SDS) for overnight at room temperature. 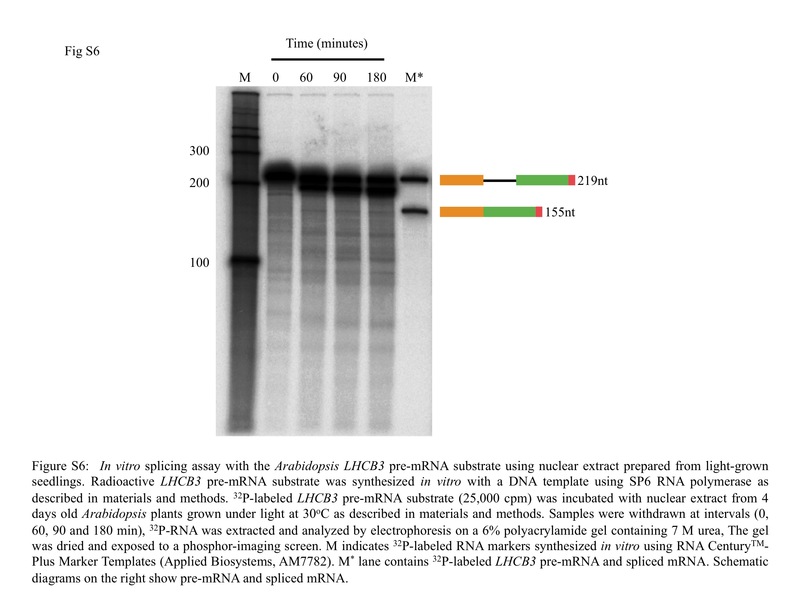 Radioactive pre-mRNAs were measured using a liquid scintillation counter (Tri-Carb Liquid Scintillation Counter, PerkinElmer, Waltham, MA, USA); 25,000 CPM (~ 20 fmol) of [32P]-labelled pre-mRNA substrates was used for in vitro splicing reactions unless otherwise specified (see figure legends). Unless otherwise specified, in vitro splicing reactions (25 μl) contained 1 mM ATP, 20 mM creatine phosphate (CP), 10 U RNase inhibitor, 1 mM DTT, 72.5 mM KOAc, 25,000 CPM (~ 20 fmol) [32P]-labelled pre-mRNA, and 50% NE. Reactions were incubated at 30 °C for the times indicated in figure legends. Subsequently, 175 μl of proteinase K master mix (1× proteinase K buffer, 0.25 mg/ml glycogen, 0.25 mg/ml proteinase K, and sterile water) was added, and the solution incubated at 37 °C for 20 min. Afterward, RNA was purified by adding an equal volume of phenol:chloroform, precipitating with 2.5 volumes of 100% ice-cold ethanol, and air-drying the isolated pellet for 5 min . Finally, RNA samples were dissolved with formamide/EDTA stop dye (formamide with 0.1% bromophenol blue, 0.1% xylene cyanol, and 2 mM EDTA). Purified RNA from in vitro splicing reactions was analyzed by fractionation on a 6% polyacrylamide-urea gel as described previously . RNA samples were heated at 95 °C for 3 min, and loaded onto a pre-run gel. The gel was run at 200 V for 3 h. Subsequently, the gel was transferred onto Whatman paper and dried for 2 h using a Bio-Rad Gel Dryer at 80 °C with suction. The gel was then exposed to a phosphor-imaging screen overnight, and imaged using a STORM 840 imager (Molecular Dynamics, GE Healthcare, Little Chalfont, United Kingdom; www.gehealthcare.com). For the S1 nuclease protection assay, in vitro spliced RNA (spliced RNA) was gel-purified as described above. The spliced product from at least three samples was pooled together. DNA oligo (50 nt, 100 μM) with sequence complementary to the exon/exon junction was hybridized to the purified RNA in S1 hybridization buffer (80% formamide, 40 mM PIPES (pH 6.4), 500 mM NaCl, 1 mM EDTA) for 2 h at room temperature after denaturing at 95 °C for 5 min . Subsequently, total hybridized [32P]-labelled RNA/oligo DNA was digested with S1 nuclease (100U) (Promega, Madison, WI; catalog number: M5761) in 1× S1 nuclease buffer (provided with the enzyme) for 1 h at 37 °C. The undigested [32P]-labelled RNA was purified by phenol:chloroform extraction and visualized as described above. Generally, in vitro splicing reactions are conducted using NE prepared from HeLa cells; however, there are reports of NEs from other cells, such as Drosophila Kc cells, also being used . The quality of NE is a vital factor for a successful and efficient in vitro splicing assay . Therefore, we aimed first to develop a method for the preparation of NE from Arabidopsis etiolated seedlings to use in in vitro splicing assays. We tried three different modified methods of NE preparation from either etiolated or light-grown seedling. Only one of these methods that is modified from different protocols [58–60] using etiolated seedlings was found to be competent in splicing a pre-mRNA. This NE preparation protocol is described in detail in the methods section (Additional file 1: Figure S1). The other two modified methods that use (1) hexylene glycol-based buffers followed by Percoll density gradients  or (2) Honda buffer method  either did not show splicing of pre-mRNA or showed very weak splicing activity in our hands. Hence, these methods are not described in detail. To test this Arabidopsis NE for in vitro splicing activity, we used a pre-mRNA substrate that contained a single intron flanked with two truncated exons from Arabidopsis gene light-harvesting complex B3 (LHCB3) (Fig. 1a, b and Additional file 2: Figure S2). The LHCB3 pre-mRNA substrate carried an 82 nt 5′ exon, 64 nt intron, and 51 nt of 3′ exon plus a 22 nt adaptor sequence for a total length of 219 nt (Fig. 1c). The [32P]-labelled LHCB3 pre-mRNA was incubated at 30 °C in Arabidopsis NE for 0, 90, or 180 min. The reaction products were isolated and analyzed by 6% denaturing polyacrylamide gel (Fig. 2a). We did not observe any [32P]-labelled spliced RNA at 0 min incubation time; however, at 90 and 180 min there were multiple [32P]-labelled species smaller than the pre-mRNA substrate. 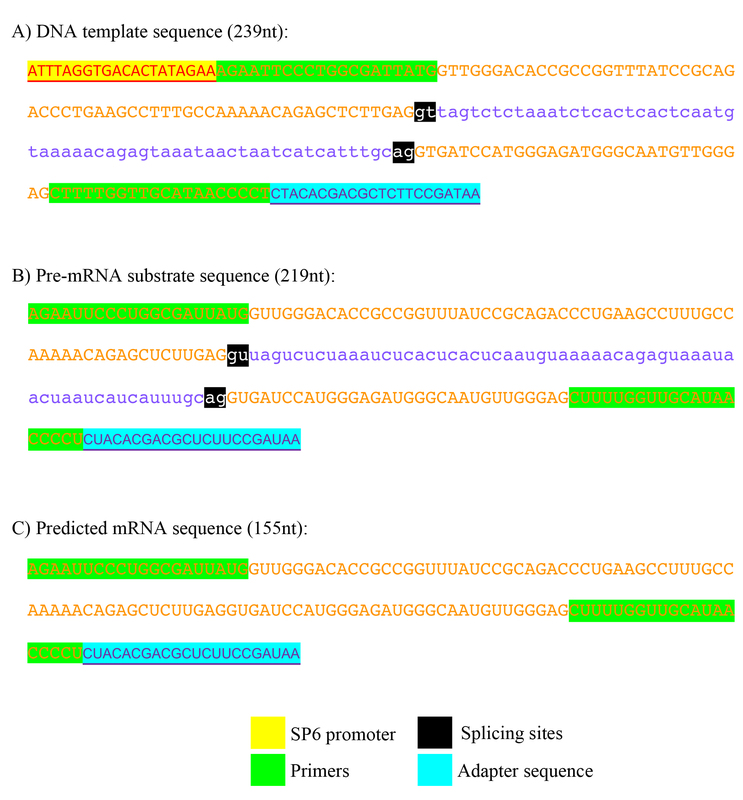 The predicted spliced mRNA is 155 nt long (Fig. 1c). Certainly, a 155 nt RNA, the expected size of spliced mRNA, was observed after 90 min, and this product was accumulated to a higher level after 180 min (Fig. 2a). We also generated a [32P]-labelled marker mRNA from an LHCB3 cDNA template (M*) for comparison with the in vitro product. In addition, we observed other RNA species (indicated with asterisks) consistently, which are likely to correspond to the pre-mRNA splicing intermediates or degradation products (Fig. 2a). This finding suggests the possible in vitro splicing of LHCB3 pre-mRNA using Arabidopsis NE. Pre-mRNA splicing is mediated via the spliceosome, which is a large and dynamic machine containing five snRNPs and numerous proteins . It has been reported that heat-treated NE prepared from HeLa cells or yeast whole cell extract was unable to form a functional spliceosome and splice pre-mRNA in vitro [66, 67]. Therefore, we incubated the Arabidopsis NE at 90 °C for 3 min, and then tested its splicing activity with [32P]-labelled LHCB3 pre-mRNA substrate. While the untreated NE converted the input pre-mRNA to the expected product, heat-treated NE was unable to do so (Fig. 2b). In agreement with non-plant splicing extracts, these results suggest that the Arabidopsis NE contains heat-sensitive components that are required for producing the splicing product. In order to determine the effect of NE concentration on the production of the spliced mRNA, a range of NE concentrations from 0 to 50% (v/v) were tested while maintaining consistent volume and chemical composition of the reactions by adding an appropriate amount of NE-containing buffer. Indeed, the production of the splicing product increased with increasing NE concentration (Fig. 2c). In addition, it seems that 30% (v/v) is an optimal NE concentration for this in vitro splicing assay. Thus, these results support that the appearance of the spliced mRNA is dependent on the concentration of proteins present in the NE. To determine whether the [32P]-labelled LHCB3 pre-mRNA substrate was accurately spliced in vitro, the spliced product was analyzed by S1 nuclease protection assay. For this assay, we used a DNA oligonucleotide (50 nt) probe designed to pair with the exon junction that is predicted to be joined together during in vitro splicing (Fig. 3a). The [32P]-labelled spliced product generated in the in vitro assay was gel-purified and at least three samples pooled together to enhance the amount of RNA present. Probes were allowed to hybridize with the purified RNA sample. In addition, the probe was also hybridized with the unspliced [32P]-labelled LHCB3 pre-mRNA substrate as a negative control. Subsequently, the hybridized molecules were digested with a single-strand nucleic acid-specific S1 nuclease. The S1-resistant products were then separated on a denaturing polyacrylamide gel and visualized by autoradiography (Fig. 3b). The estimated size of the protected sequence is ~ 50 nt long, and indeed, the predicted in vitro splice product generated an S1-resistant product with approximately size of ~ 50 nt. Conversely, the unspliced pre-mRNA produced smaller products including sizes of around 25 nt. These results suggest that the [32P]-labelled LHCB3 pre-mRNA is accurately spliced in vitro to generate the authentic mRNA sequence spanning the LHCB3 exon1-exon2 junction. During the pre-mRNA splicing process, the spliceosome assembles around the 5′ss at the beginning of an intron and the 3′ss at the end of that intron . It is well-established that each splice site in plants and animals consists of consensus sequences, and these include almost invariant dinucleotides: GT at the 5′ss and AG at the 3′ss . In vitro mutation analysis of the conserved 5′ss GT revealed that these mutations could modulate splice site choices and reduce the rate of two exons ligating . Therefore, we aimed here to investigate if substitution mutations of 5′ss GT in the LHCB3 pre-mRNA substrate affect the production of its in vitro spliced product. To this end, we generated a LHCB3 pre-mRNA substrates carrying substitution mutation of 5′ss GT to AC (Mutant 1, M1) (Fig. 4a, Additional file 3: Figure S3). In addition, since a previous study showed that mutation of the 5′ss GU did not prevent cleavage in 5′ss region, but only affected the production of spliced mRNA , we also included another mutated pre-mRNA substrate (Mutant 2, M2). In this substrate, both 5′ss and 3′ss conserved sequences (− 3, + 5) are changed . In vitro splicing assays using these pre-mRNA substrates revealed that mutations of the conserved splice site sequences modulate the in vitro production of LHCB3 spliced mRNA (Fig. 4b). In agreement with a previous study , M1 did not completely abolish the production of spliced mRNA; however, this mutation clearly reduced the generation of the spliced mRNA. Interestingly, M2 completely eliminated the production of the expected product, and instead resulted in a new RNA band of ~ 100 nt (Fig. 4b). These findings further demonstrate that Arabidopsis NE supports pre-mRNA splicing. It has been shown previously that different in vitro splicing reactions have narrow optimum temperatures. The optimum temperature for the mammalian in vitro splicing assay is 30 °C, while for the yeast in vitro splicing system it is 25 °C [2, 4]. Therefore, to address the effect of incubation temperature on the accumulation of the spliced product, reactions were carried out at different temperatures: 24, 30, 37, and 42 °C (Fig. 5a). The results showed that 24 °C is the optimal incubation temperature for high accumulation of the spliced mRNA. The quantity of the spliced product is decreased with increasing incubation temperature. In fact, the incubation at 42 °C greatly reduced the appearance of spliced mRNA, suggesting the sensitivity of the reaction to high temperature, as was shown in the previous experiment (Fig. 2b). Thus, these findings indicate that the in vitro splicing assay using Arabidopsis NE has an optimal temperature of 24 °C, and further demonstrate that the NE contains heat-labile components required for generating the spliced product. It has been well-established that mammalian, yeast, and Drosophila in vitro splicing reactions require exogenous ATP and Mg2+ [2, 4, 5]. Therefore, we aimed here to investigate and optimize the requirement of these cofactors for the Arabidopsis-derived in vitro splicing reaction. Notably, the NE preparation method does not involve a dialysis step against the swelling buffer, hence the NE contains endogenous concentrations of ATP and Mg2+. In addition, the 25 μl in vitro splicing reaction containing 50% NE has 2.5 mM Mg2+, as the swelling buffer contains 5 mM MgCl2. The ATP concentration of the in vitro splicing reaction was varied while holding the concentrations of remaining components constant (Fig. 5b). In the absence of exogenously added ATP, some RNA degradation was observed. In contrast, the addition of ATP maintained input pre-mRNA integrity and also enhanced production of the spliced mRNA. There were no obvious differences in effect between the ATP concentrations (1, 2, and 3 mM) tested. Therefore, these results indicate that the addition of exogenous ATP might support splicing in vitro, and the optimal concentration is ~ 1 mM. In the same manner, the effect of varying Mg2+ concentration on the in vitro reaction was investigated (Fig. 5c). We found that 2.5 mM Mg2+ was likely an optimal concentration for the in vitro splicing reaction. Indeed, increasing Mg2+ to 5 mM caused input pre-mRNA instability. On the other hand, in vitro splicing activity was reduced by the addition of 2.5 or 5 mM EDTA, an ion-chelating agent, indicating a divalent cation requirement (Fig. 5c). Taken together, these findings suggest that the plant-derived in vitro splicing reaction is like other in vitro splicing system requires ATP and Mg2+. In vitro splicing systems derived from mammals, yeast, and Drosophila have allowed remarkable progress in illustrating splicing mechanisms in eukaryotes. There is no in vitro splicing assay for plant systems. Hence, many aspects of pre-mRNA splicing in plants are unknown. In an effort to develop a plant in vitro pre-mRNA splicing system, we report here experimental evidence suggesting that NE derived from Arabidopsis etiolated seedlings is capable of splicing plant pre-mRNA in vitro. In this study, we show that Arabidopsis NE was able to convert the pre-mRNA of LHCB3 substrate into an expected size of spliced mRNA. The data presented here strongly suggest that the RNA product that corresponds to the spliced mRNA marker is likely a spliced product. Production of the expected size of mRNA upon incubation of pre-mRNA template in the NE, indication that the two exons are linked together according to a junction mapping assay using S1 nuclease, and demonstration that substitution mutations of conserved splice site sequences inhibit the appearance of spliced mRNA—all suggest splicing of LHCB pre-mRNA in plant NE. In addition, we found this system to be similar to the well-established non-plant in vitro pre-mRNA splicing assays in several ways. First, this system is sensitive to high temperature; second, it requires Mg2+; and third, ATP is necessary for the generation of spliced mRNA. From these experiments, we conclude that this is a promising progress towards developing an efficient plant in vitro splicing system. The establishment of an in vitro splicing system for plants has been long overdue; difficulties in developing one may be because of characteristics inherent to plant cells. Our success in establishing this in vitro assay may be attributed to plant materials used for NE preparation, NE preparation method, and choice of pre-mRNA substrate. The NE is prepared from Arabidopsis seedlings that were grown under dark conditions, which are actively growing. The actively growing seedlings have high levels of gene expression for which active pre-mRNA splicing machinery is also needed. Furthermore, unlike other preparation methods that include a high salt lysis buffer, we applied a method that uses low denaturing conditions. This may maintain protein integrity and result in protection of the native states of spliceosomal machinery. Moreover, it is known that not every pre-mRNA substrate can be spliced in vitro, and each substrate requires optimized in vitro splicing conditions . Thus, the choice of pre-mRNA substrate and its primary structure is also a significant factor for successful in vitro splicing systems. In addition, the number and types of splicing factors as well as assay conditions may be different for different pre-mRNAs. We chose LHCB3 pre-mRNA as this gene is highly expressed and is likely to be processed efficiently. In addition to LHCB3, we tested three other plant pre-mRNA substrates (adaptor protein-2 Mu-Adaptin (AP2M), TIP41-like protein (TIP41) and polypyrimidine tract-binding protein 1(PTB1) in plant NE with the assay conditions used for LHCB3 pre-mRNA splicing. A schematic diagram and the nucleotides sequences of these pre-mRNAs are provided in Additional file 4: Figure S4A and Additional file 5: Figure S4B, We did not see a spliced product from these pre-mRNAs under the conditions tested (Additional file 6: Figure S5). However, it is likely that different pre-mRNAs require different assay conditions, which need to be optimized for each substrate. In animals also, only a few pre-mRNAs such as β-globin, β-tropomyosin, adenovirus, δ-Crystallin, and Simian virus 40 (SV40) pre-mRNA are widely used, suggesting that only a few pre-mRNA are efficiently spliced under in vitro conditions [69–71]. In developing this assay, in our initial trials we used NE from light-grown plants also. However, these extracts showed very little splicing activity with the LHCB3 pre-mRNA (Additional file 7: Figure S6), hence we focused our studies on the NE prepared from the etiolated seedlings in characterizing this system. It is possible that the composition and purity of NE prepared from etiolated and light-grown seedlings is different resulting in differential efficiencies in splicing activity. Convincing evidence also suggests that the plant in vitro splicing assay system is quite similar to assays used for mammals, yeast, and Drosophila. Similarities involve assay conditions, including concentrations of ATP, Mg2+, and K+ . In addition, the time course of a splicing reaction (0–180 min) is comparable between this in vitro splicing assay and other such systems [2, 4, 5]. Meanwhile, the optimal incubation temperature for this splicing reaction was unlike other splicing systems; it was within the range of the optimal growth temperature for Arabidopsis (23–25 °C) . Another point of interest is that in vitro splicing of the LHCB3 pre-mRNA substrate generated other RNA species in addition to the spliced RNA. Given the sizes of each part of the pre-mRNA substrate and the production of RNA species within the size range of the intermediates suggest these species are likely splicing intermediates [6, 73]. In addition, the other RNA species that exhibited unexpected mobility on the gel might correspond to lariat-containing RNA intermediates generated during splicing [6, 73]. Meanwhile, we cannot rule out the possibility that some of these RNA species might result from degradation of the pre-mRNA substrate. Another point of interest is provided by the observation that substitution mutations of splice site consensus sequences in the LHCB3 pre-mRNA modulate the in vitro splicing reaction. Some early studies using a point mutation strategy in the mammalian in vitro splicing assay have investigated the function of splice site consensus sequences [68, 74]. Compared with their results, our finding that mutation of the 5′ss causes reduction of splicing efficiency indicates some similarities between these two systems. Taken together, these findings strongly support that Arabidopsis NE supports in vitro splicing system, which could be used to uncover plant-specific splicing regulatory mechanisms. The efficiency of splicing in this in vitro system was low. It is worth mentioning that the efficiency of other initial in vitro splicing assays was also low; however, researchers were able to improve the efficiency of in vitro splicing assays over time [71, 75, 76]. Further investigations will be very helpful in gaining more insights for improving the efficiency of this plant in vitro splicing assay. In addition, it is possible that the concentration of some spliceosomal proteins is less than optimum in our NE, leading to low efficiency. In animals, splicing deficient extracts can be made competent by adding one or more splicing factors such as SR proteins [9, 77]. In future, one could purify one or more SR proteins and supplement the NE or use transgenic lines that are overexpressing one or more SR proteins to prepare NE to enhance splicing efficiency. In summary, we show that NE derived from Arabidopsis etiolated seedlings is capable of splicing LHCB3 pre-mRNA. This plant-derived in vitro splicing assay system opens new avenues to investigate the spliceosome assembly and composition in plants, splicing regulatory mechanisms specific to plants, and thereby enhance the overall understanding of post-transcriptional gene regulatory mechanisms in eukaryotes. ASNR conceived the project. MA and ASNR designed experiments and analyzed the results. MA performed all the experiments. MA and ASNR wrote the manuscript. Both authors read and approved the final manuscript. The open access publishing fees for this article have been covered in part by the Colorado State University Libraries Open Access Research and Scholarship (OARS) Fund. We thank Dr. Jeffrey Wilusz, Dr. Tai Montgomery and Dr. Asa Ben-Hur for their comments on this work. All the data and the methods used in this study are available in this published article. Any additional information pertinent to this work can be obtained from the corresponding author. MA is supported by a scholarship from the government of the Kingdom of Saudi Arabia. 13007_2017_271_MOESM1_ESM.jpg Additional file 1: Figure S1. Schematic diagram showing the steps in NE preparation from four-day-old Arabidopsis thaliana etiolated seedlings. See “Methods” for details. 13007_2017_271_MOESM2_ESM.jpg Additional file 2: Figure S2. Sequences of DNA template (A), pre-mRNA substrate (B), and predicted mRNA (C). Arabidopsis LHCB3 (AT5G54270) sequence was extracted from The Arabidopsis Information Resource (TAIR). Exonic sequences are shown in upper case letters, while the intron sequence is shown in lower case. 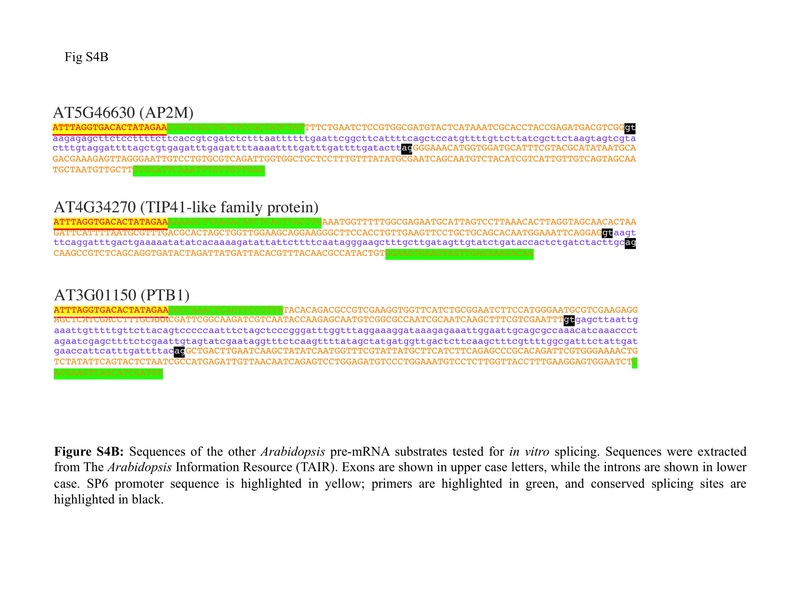 SP6 promoter sequence is highlighted in yellow; primers are highlighted in green with either SP6 or adapter sequences: conserved splicing sites (GT–AG) are highlighted in black, and adaptor sequence is highlighted in blue. 13007_2017_271_MOESM3_ESM.jpg Additional file 3: Figure S3. (A) Sequences of wild type (WT) and mutated (mutant 1 and mutant 2) DNA templates used to prepare pre-mRNA substrates. (B) Oligo DNA sequence used for S1 nuclease assay. 13007_2017_271_MOESM4_ESM.jpg Additional file 4: Figure S4. (A) A schematic diagram other Arabidopsis pre-mRNA substrates that were tested for in vitro splicing. Gene names and ID numbers are displayed at the top of each substrate. Introns are black thin lines, first exons are orange boxes, and second exons are green boxes. SP6 promoters are red boxes. Numbers within the boxes or at the top of the introns indicate the length (in nucleotides (nt)) of each region. Introns’ UA content is shown under each intron. The numbers listed on the right indicate the full length of each substrate. The length of exons and introns is drawn to scale. 13007_2017_271_MOESM5_ESM.jpg Additional file 5: Figure S4. (B) Sequences of the other Arabidopsis pre-mRNA substrates tested for in vitro splicing. Sequences were extracted from The Arabidopsis Information Resource (TAIR). Exons are shown in upper case letters, while the introns are shown in lower case. SP6 promoter sequence is highlighted in yellow; primers are highlighted in green, and conserved splicing sites are highlighted in black. 13007_2017_271_MOESM6_ESM.jpg Additional file 6: Figure S5. In vitro splicing assay of different Arabidopsis [32P] labeled pre-mRNA substrates. Radiolabelled AP2M, TIP41 and PTB1 pre-mRNA substrates were incubated individually at 30 °C in the Arabidopsis nuclear extract as described previously. Samples were withdrawn at indicated times, extracted [32P]-RNA and analyzed by electrophoresis on a 6% polyacrylamide-7 M urea gel, followed by autoradiography. The sizes of the pre-mRNA substrates are indicated at right. 13007_2017_271_MOESM7_ESM.jpg Additional file 7: Figure S6. In vitro splicing assay with the Arabidopsis LHCB3 pre-mRNA substrate using nuclear extract prepared from light-grown seedlings. Radioactive LHCB3 pre-mRNA substrate was synthesized in vitro with a DNA template using SP6 RNA polymerase as described in materials and methods. [32P]-labeled LHCB3 pre-mRNA substrate (25,000 cpm) was incubated with nuclear extract from 4 days old Arabidopsis plants grown under light at 30 °C as described in materials and methods. Samples were withdrawn at intervals (0, 60, 90 and 180 min), [32P]-RNA was extracted and analyzed by electrophoresis on a 6% polyacrylamide gel containing 7 M urea, The gel was dried and exposed to a phosphor-imaging screen. M indicates [32P]-labeled RNA markers synthesized in vitro using RNA Century™-Plus Marker Templates (Applied Biosystems, AM7782). M* lane contains [32P]-labeled LHCB3 pre-mRNA and spliced mRNA. Schematic diagrams on the right show pre-mRNA and spliced mRNA.